Service, food and entertainment were fabulous. Always smiling face, delicious taste,and a increadible talent on board an exquisite ship!!! Bravo, crew of the NCL Escape!!! From Howl at the moon with Ben Michaels, Rob and Marty, the levity comedy with Flip Schultz , the iconic singing of Sharon Wilkins, to the Choir of Man performance , And After midnight and Bratpack Musicals, to the for cuisine, bars featuring almost 100 brews, specialty cocktails from around the world, and incredible customer service throughout the vessel, the NFL Escape was an experience for the ages.... and special needs friendly!!! 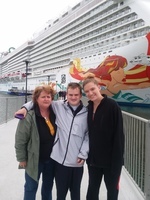 The ports were warm, friendly, and our NCL excursions were well done.. A lifetime of family memories in just 12 days. And the thermal spa... a must!!! The ultimate in comfort, relaxation and enjoyment. Loved the sauna, salt water pool, steam room, and more!!! Thank you, to the crew of the Norwegian Escape!!! Service, food and entertainment were fabulous. Always smiling face, delicious taste,and a increadible talent on board an exquisite ship!!! Bravo, crew of the NCL Escape!!! , And After midnight and Bratpack Musicals, to the for cuisine, bars featuring almost 100 brews, specialty cocktails from around the world, and incredible customer service throughout the vessel, the NFL Escape was an experience for the ages.... and special needs friendly!!! The ports were warm, friendly, and our NCL excursions were well done..
A lifetime of family memories in just 12 days. And the thermal spa... a must!!! The ultimate in comfort, relaxation and enjoyment. Loved the sauna, salt water pool, steam room, and more!!! Thank you, to the crew of the Norwegian Escape!!! Cabin steward Riana was the best!!!! !